The Uplift Premium Power Seat with LeveLift™ technology is an electric-powered portable lifting seat that will lift you safely and gently from almost any armchair or sofa without dumping you forward. It is easy to move from room to room inside your home. Uplift Premium Power Seat is easy to operate with an arthritis-friendly toggle with movable, cloth-covered gooseneck style hand controller. You can stop at any point to adjust the height to your task or comfort level. Designed to provide 100% lift assistance for those weighing up to 300lbs. We are looking to purchase one of these lifting seats in Israel. Is there. Distributor there? where can I obtain another power lever? 1. 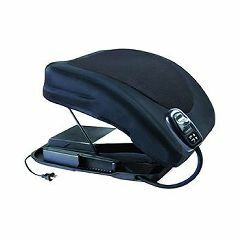 Does the uplift premium power lifting seat (565122) work from an armchair (the overstuffed kind)? 2. Is this model soft or is the seat hard and uncomfortable?